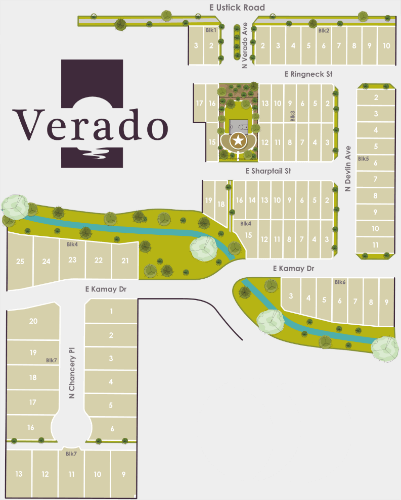 Welcome to Verado, a dynamic community of new homes in Northeast Meridian, ID. Verado offers residents a low-maintenance lifestyle, thoughtful neighborhood amenities and proximity to the best Meridian has to offer. Priced from the low $200s, homebuyers will find a variety of well-appointed single-family homes and townhouses designed to maximize living on a smaller footprint. Enjoy a private park with playground, swing set and half-court basketball as both front and backyard landscaping is maintained by HOA. The Village at Meridian is only 2 miles away with premier shopping, fine dining, entertainment and the Village Cinemas. Also close by, Julius M Kleiner Park, a 58-acre recreation lover's paradise is complete with an amphitheater, community garden, playgrounds, walking paths and arboretum. Search all new homes in Meridian by neighborhood, price, builder and more. Or browse our extensive guide to Meridian new subdivisions. South of Ustick Rd between N Locust Grove Rd and N Eagle Rd, Meridian, ID 83646. The Meridian homes for sale in Verado are selling quickly. Learn more by contacting us online or calling a new home specialist at (208) 391-4466 today.